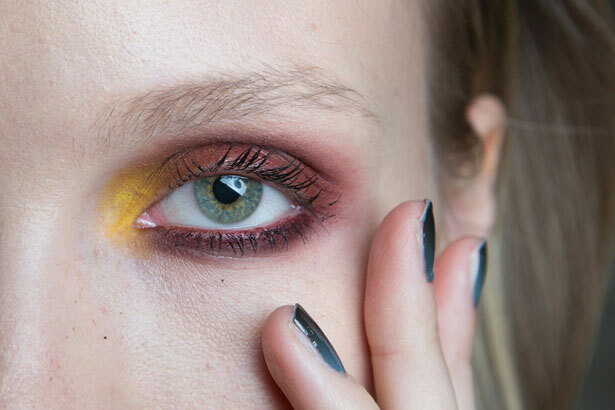 Inspired by “the deep, dark and mysterious creatures from the Congo Jungle in the Central African Republic,” it was all jungle everywhere at Christian Siriano’s Fall 2015 show, including beauty. “Because of the Congo Jungle theme, we wanted to create soft, beautiful hair with texture around the face,” explained Sebastian Professional lead stylist Anthony Cole. 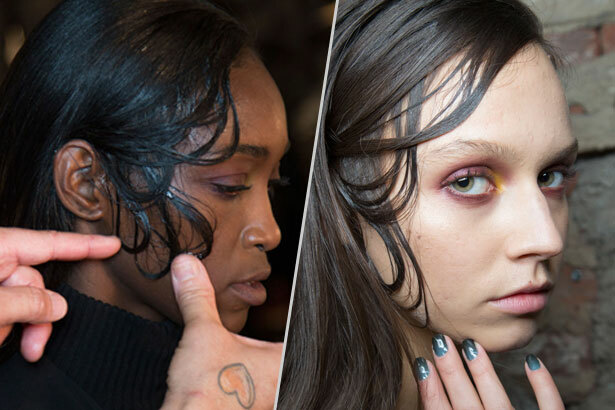 “There’s a misty yet romantic feel to the look as though the wind naturally blew the models’ hair and it stuck to the sides of their faces.” The key product used to get the hair to adhere to the side was Sebastian Professional Liquid Steel. It created a hard texture, though, so Cole advises that it be mixed with the brand’s Microweb Fiber for anyone looking for a more fluid finish.